The label conformal therapy has been applied to a wide variety of three-dimensional treatment planning and delivery procedures. The original concept for conformai therapy was to limit the normal tissue dose by conforming the treatment field to the beam’s-eye view (BEV) projection of the target volume under continuous rotation of the gantry . A multileaf collimator (MLC) is generally used to efficiently collimate the multiple fields. 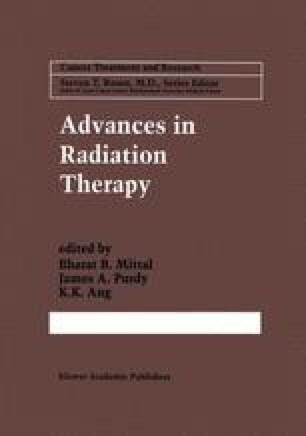 Initial clinical trials are in progress with a form of fixed-field conformai therapy that relies on BEV field shaping of six or more fixedgantry fields to reduce the volume of normal tissue irradiated around a target volume [2–4].